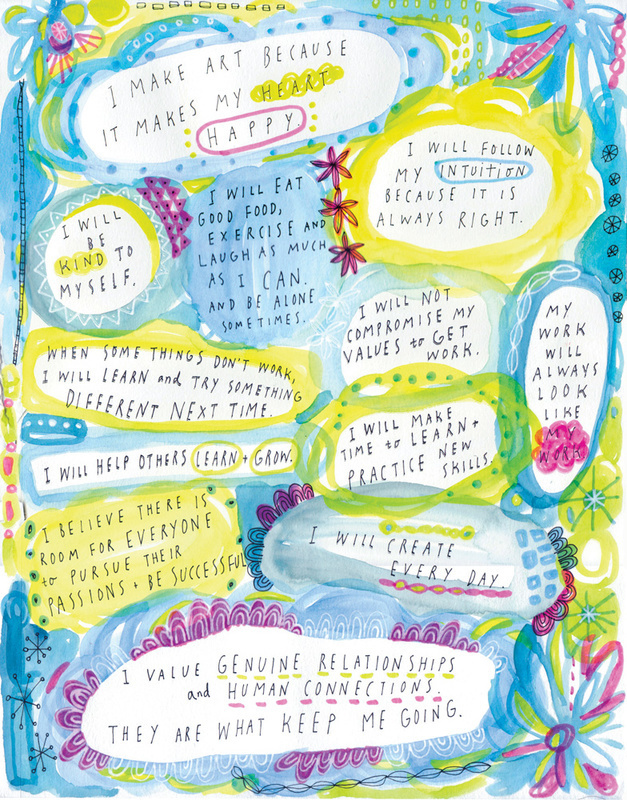 Check out these beautiful artist manifestos! 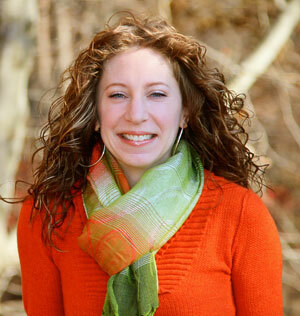 I offered a free 4-week Creative Coaching email challenge during the month of January. I had about 40 creatives join me and sent out one prompt/challenge every Monday. I had a great time coming up with the challenges and enjoyed helping other artists explore their creative passions and make plans to achieve their goals. 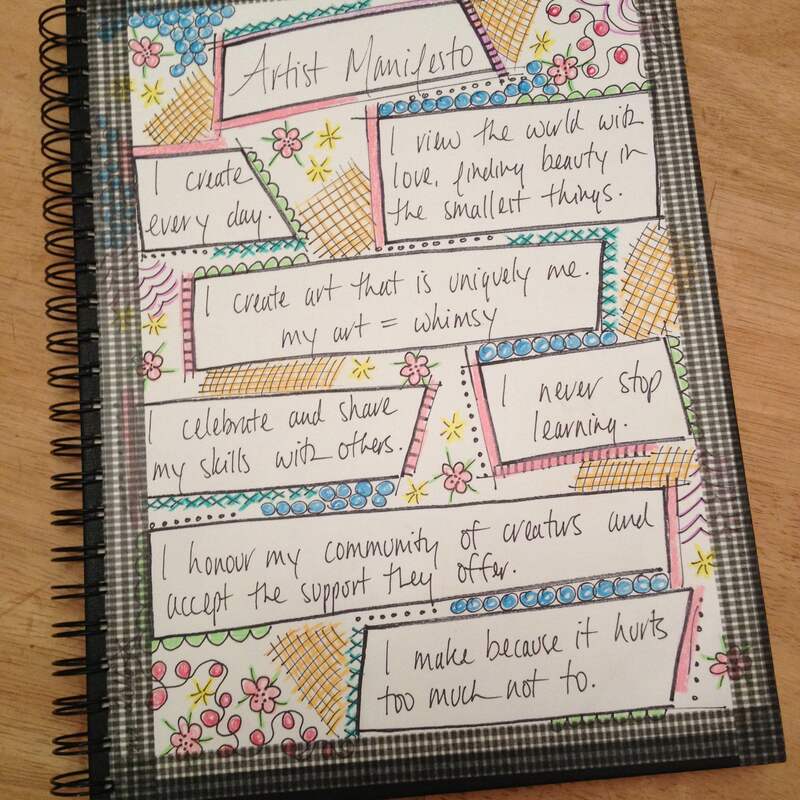 First week’s challenge was to create an artist manifesto. What the heck is an artist manifesto, you might ask? Well, you can think of your manifesto as your personal or professional values statement. It’s a set of guiding principles to live your creative life by. No matter what your creative pursuit is or where you are in your journey, it’s absolutely critical for you to understand why it’s important to you. Following your creative passion is a very rewarding but often lonely and scary journey. When the road gets rough and you start wondering if it’s all worth it, I want you to remember that you’re choosing this path for yourself. You’re saying yes to your creative passion because you want to, not because someone is forcing you to! Your artist manifesto is like your compass. When you feel lost in your creative endeavor, you can always come back to it, and it’ll help you make a decision that is best for you. I thought this was a perfect way to kick off our challenge for the month, and a lot of participating artists thought so too! I asked if I could share their beautiful work and the process with you, my lovely blog readers, and I’ve got an enthusiastic YES from a handful of the artists! I am a painter/mixed media artist. I am truly my best self when I am immersed in the creative process. 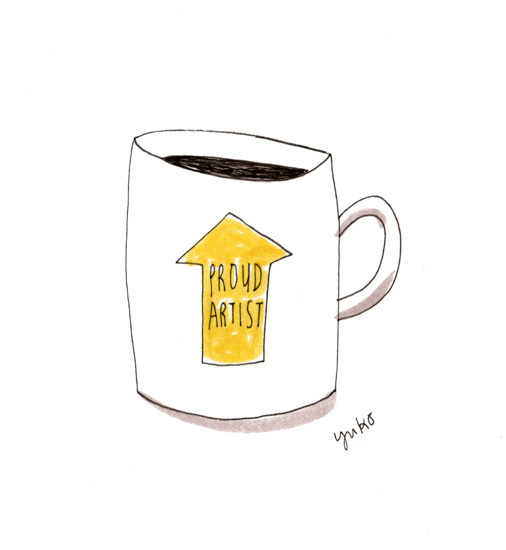 I was struggling with self-promotion, balance and finding a direction that was authentic to who I am as an artist. I was growing in many different directions at once without any real focus. Working with Yuko I was able to create a plan and even narrowed down a direction (for now) that will support my continued growth as an artist (just even being ok with referring to myself as artist was a big deal). I liked creating my personal manifesta because instead of just writing about my creative process or who I wanted to be as a painter; I was able to shift my focus to the bare bones of who I am and how I move through life as artist. I’m a mixed media and embroidery artist living in New Jersey and am always on the lookout for moments of wonder that I can capture in my work. I love to combine paint and thread to highlight beauty in places that are easily overlooked. My desire is to invite my audience to find reasons to delight in life’s ordinary, yet magical moments. Currently I’m working on expanding my product line beyond wall art to include other home decor items. I actually had a lot of fun working on my manifesto – it came at just the right time when I was floundering a bit with my work and feeling a little lost. This project helped me really drill down to why I’m doing what I’m doing and gave me the momentum I needed to keep pushing forward. I find without reminders like this, I can get lost in the weeds of busyness and start comparing myself to other artists too much. My artist manifesto reminds me I’m on a unique journey filling a role that only I can fill. 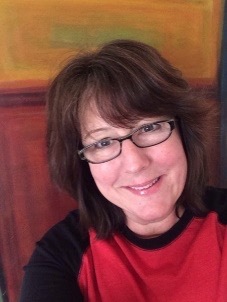 Tania Denyer, 46 years old, have been an artist since ever I can remember. I sew, crochet, draw, paper craft, cook, bake… if it requires my hands and my heart, I am there. 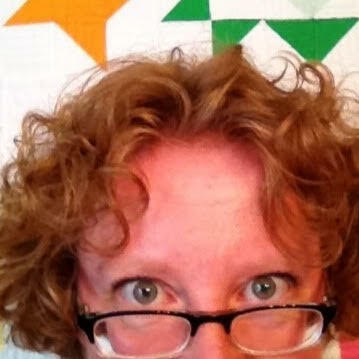 In 2014 (after an unexpected and traumatic job loss) I decided to start my business, Ginger Quilts. 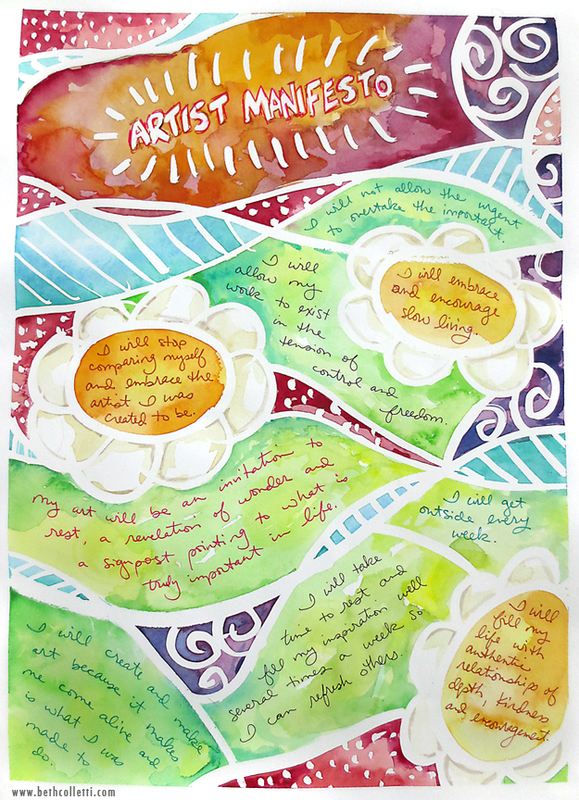 Creating my artist manifesto was at first a bit daunting, then as the thoughts came and I worried less over what I should and should not say (silencing the critic) it was fun! I felt empowered. I decided to write it out and doodle a bit (I have a doodling heart) and tape it somewhere I would see it instead of hiding it away. I felt it needed to be somewhere I could see it, read it and remember it… putting it on my sketchbook (I try to sketch everyday) was exactly where it needed to be. 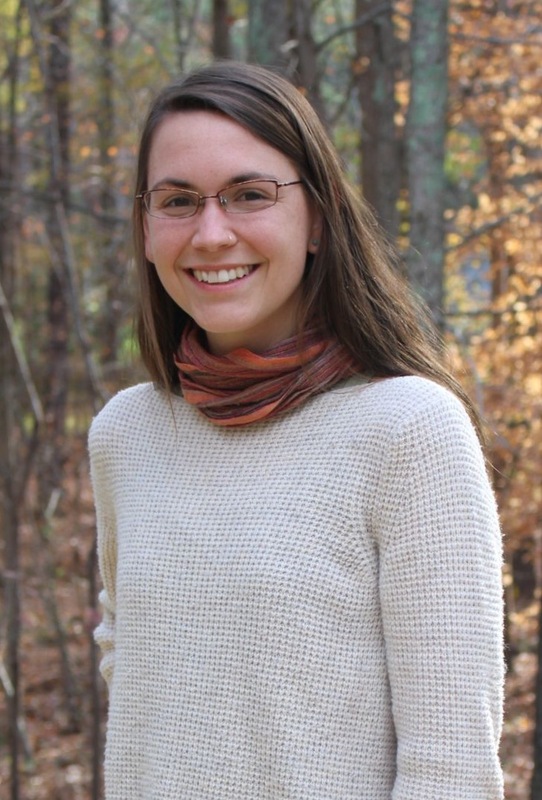 My name is Emily Vanderlinden and I’m a volunteer, artist, and self-guided learner. This means I have decent say in how I spend my time so I try to balance it between being in community with those around me, researching topics related to my Open Masters (find out more at www.openmasters.org), and block-printing on fabric. Most days I manage the social media accounts and website for Innisfree Village, a lifesharing community with adults with disabilities, and participate in art making with those adults. Whenever I can squeeze in some time, I read books about the optimal human experience, how to find flow and happiness in our work, art therapy, and printmaking. 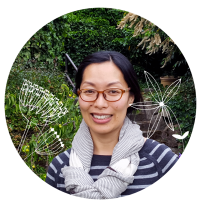 I also go on walks and hikes to get inspiration from nature and create block-printed patterns according to those findings. I have a degree in Graphic Design, so I also do some freelance work for friends when I can! I do a lot of my work on the computer so most of my brainstorming for this manifesto happened in rapid typing and stream-of-consciousness sentences! I’ve thought a lot about this in the past so it wasn’t particularly difficult, though finding a format that made sense was a challenge! 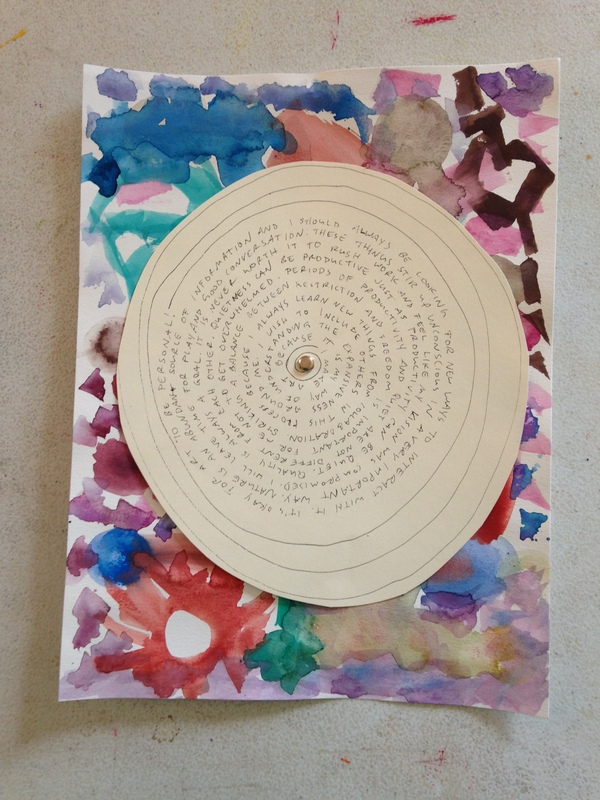 I chose to do my artist manifesto in a circular form to remind me that this is continuous and I can always add to it. After completing the writing, however, the paper felt boring and I wanted to leave the text clean so I chose to attach with a brad it to a colorful backing by one of the artists I work with. This way it spins for easier reading and reminds me what colorful people I have in my life to draw from! By the time my manifesto was finished I realized that content AND function are a huge part of why I do what I do. 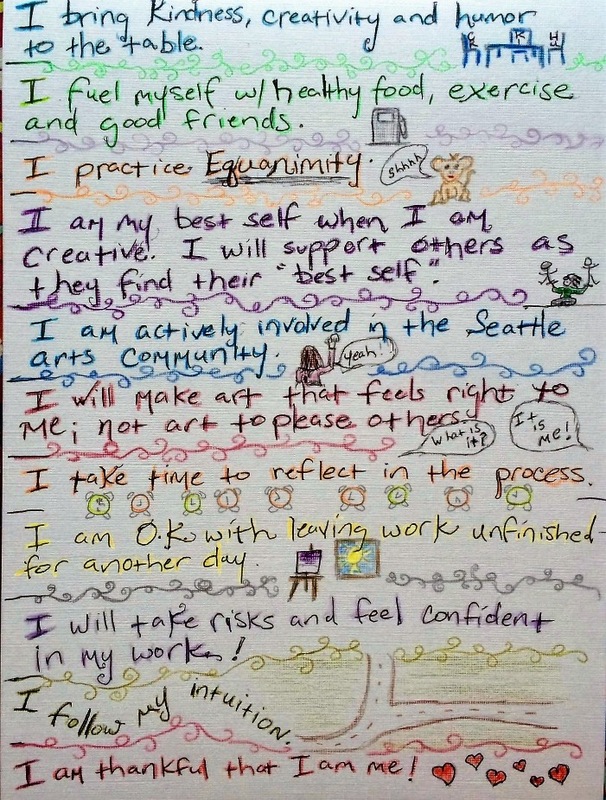 Isn’t it so cool to see how different artists come up with their artist manifesto? Every time I received an email from the participating artists and read/saw what they were working on, I got the chills. It was such a humbling experience to be the witness to their struggles, joy, and growth. I was so honored to have them and others join me and learn with me in January! Make sure to check out their work and follow them on various social media platforms 🙂 BIG thanks to everyone who participated!! I created this PDF A Guide to Creating Your Artist Manifesto in case you missed the challenge and want to make one! I’m pretty sure I’ll be hosting a challenge like this again in the future – if you want to be kept in a loop, you can sign up for my e-newsletter here.